Leones de Caracas cheerleaders pose for a photo with a young fan wearing a lion costume prior to the season's opening baseball game between Leones de Caracas and Tiburones de la Guaira in Caracas, Venezuela on Friday. From field crews to ticket scalpers to hot dog vendors to cheerleaders, thousands of families depend on baseball to make a living. 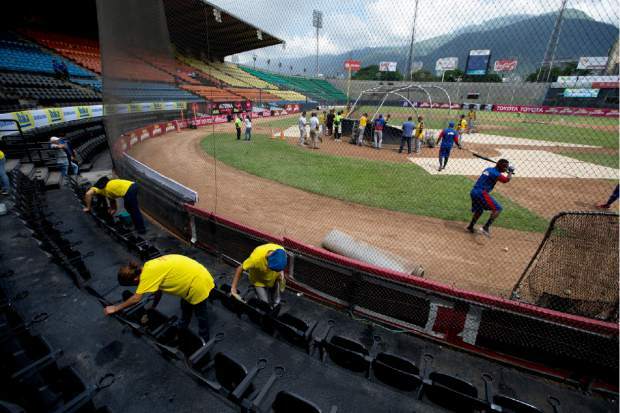 Workers clean the VIP seating area prior to the baseball season's opening game between Leones de Caracas and Tiburones de la Guaira in Caracas, Venezuela on Friday. Ramon Guillermo Aveledo, a former Venezuela baseball league president and prominent opposition leader, said he applauds the government's decision to spend its dwindling supply of dollars on baseball while acknowledging there are more pressing needs. Leones de Caracas' starting pitcher Luis Diaz throws to Tiburones de la Guaira's Junior Sosa during the first inning of the season's opening baseball game in Caracas, Venezuela. While many of the 70-plus Venezuelan players on big league rosters return home for a few games each season, most arriving this year are little known and don't reflect the nation's powerhouse talent. Firefighters salute during the national anthem at the start of the baseball season's opening game between Leones de Caracas and Tiburones de la Guaira in Caracas, Venezuela on Friday. 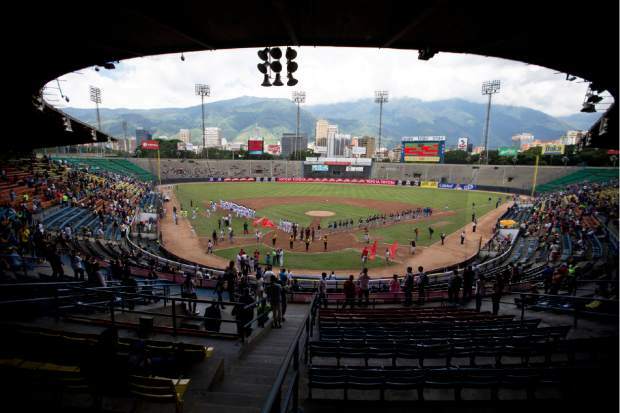 Baseball stadiums have served as a sporting sanctuary where fans of all classes and political backgrounds can set aside their differences and mounting hardships, said Ramon Guillermo Aveledo, a former Venezuela baseball league president and prominent opposition leader. 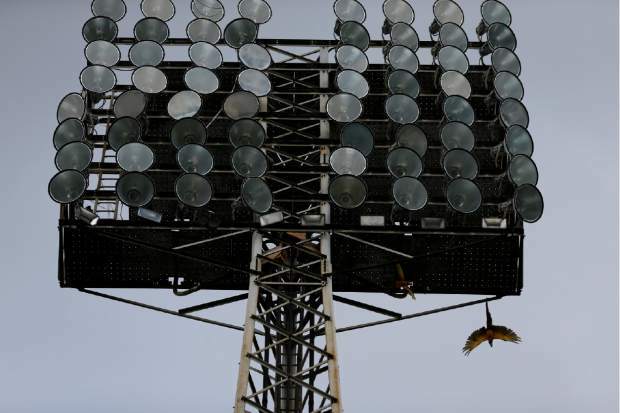 Parrots fly out from under a light tower during the baseball season's opening game between Leones de Caracas and Tiburones de la Guaira in Caracas, Venezuela on Friday. Venezuela is scheduled to host the Caribbean Series in February 2019 in the city of Barquisimeto, one of the city's hardest hit by power outages that have roiled much of the country. Baseball fans of Leones de Caracas pose with the team's mascot prior to the season's opening game against the Tiburones de la Guaira in Caracas, Venezuela. Last year's stadium attendance rose 5 percent amid the political and economic crisis, although it remains down by a third from a peak in the 2013-2014 season. Oswaldo Guillen, coach of Tiburones de la Guaira, practices batting prior to the season's opening game between Leones de Caracas and Tiburones de la Guaira in Caracas, Venezuela on Friday. The former All-Star shortstop known better as "Ozzie" said he was tempted to skip returning home to manage the team for the third straight season. 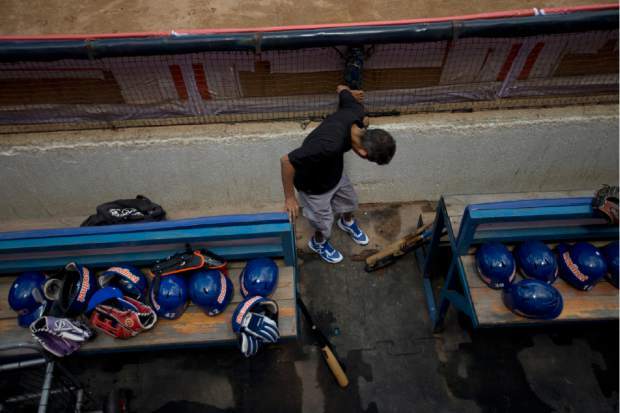 A stadium worker adjusts floor mats in the dugout of the Tiburones de La Guiara team prior to the baseball season's opening game between Leones de Caracas and Tiburones de la Guaira in Caracas, Venezuela on Friday. During the offseason, vandals picked through stadiums across the country; groundskeepers have been battling water shortages; and ticket prices remain a mystery, with most clubs changing them by the week to keep pace with inflation soon to reach 10 million percent. 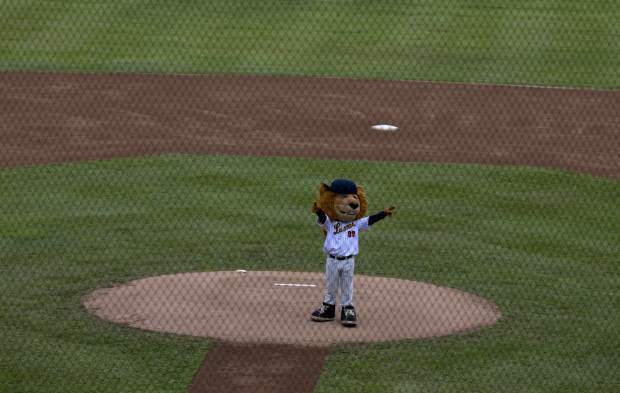 Tthe mascot of Leones de Caracas greets the public from the pitchers' mound at the baseball season's opening game with Tiburones de la Guaira in Caracas, Venezuela. Throughout Venezuela, as winter league play gets underway, fans are having to make sacrifices to feed their passion for the "pelota," or the ball, as the national pastime is affectionately known. Baseball players and fans stand for the national anthem during the opening season baseball game on Friday between Leones de Caracas and Tiburones de la Guaira in Caracas, Venezuela. For the second straight year, state-run oil company PDVSA had to step in with a $12 million lifeline to pay for everything from imported baseballs to the salaries of seven foreign-born players -- most of them minor league prospects from the U.S. -- on each team's roster. 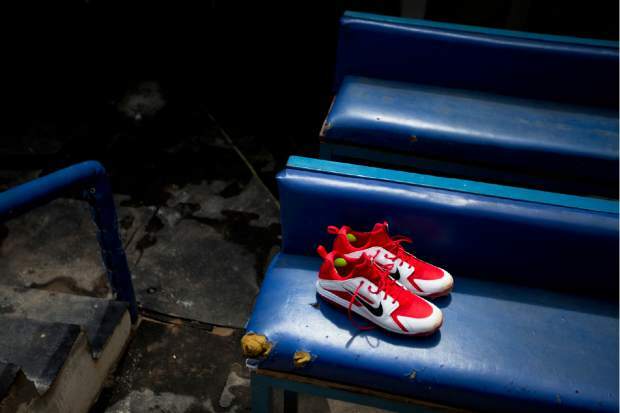 A pair of new baseball shoes sit on a worn-out bench in the Los Tiburones de la Guaira's dugout prior the season's opening game on Friday against Leones de Caracas in Caracas, Venezuela. Venezuela's once highly competitive winter league has been in decline for years and major league organizations have shut down all their academies in the country. 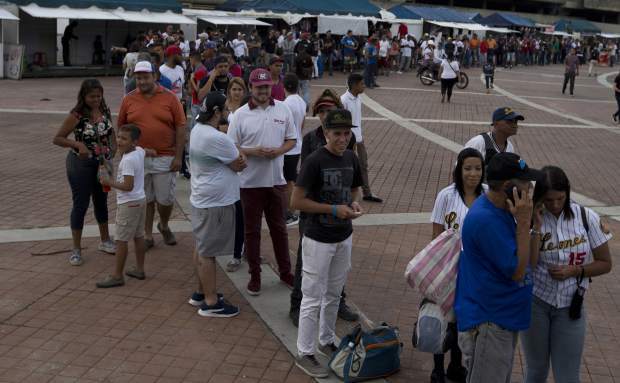 People line up to buy tickets for the season's opening baseball game on Friday between Leones de Caracas and Tiburones de la Guaira in Caracas, Venezuela. Hyperinflation has pulverized incomes while putting ticket prices out of reach for many. 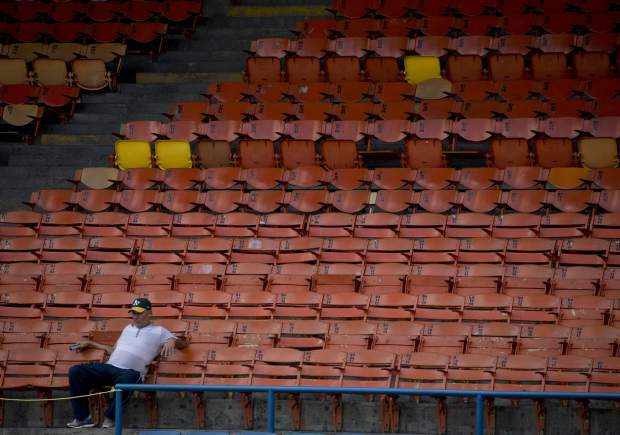 A lone baseball fan waits for the season's opening baseball game between Leones de Caracas and Tiburones de la Guaira in Caracas, Venezuela on Friday. Some baseball fans avoid the ballpark for fear of getting mugged or because they don't know how they'll get home amid a nationwide transportation crisis. CARACAS, Venezuela — For 10 years, ever since they bonded over baseball at work, Franlet Bencomo and Elbert Albarran haven’t missed an opening day game together. Throughout Venezuela, as winter league play gets under way, fans are having to make similar sacrifices to feed their passion for “pelota,” — the word for ball that’s used to describe the national pastime. Hyperinflation has pulverized incomes while putting ticket prices out of reach for many. Others are avoiding the ballpark for fear of getting mugged or because they don’t know how they’ll get home amid a nationwide transportation crisis. In response, more daytime games are being played. Venezuela’s eight professional teams are struggling. For the second straight year, state-run oil company PDVSA had to step in with a $12 million lifeline to pay for everything from imported baseballs to the salaries of the seven foreign-born players — most of them minor league prospects from the U.S. — on each team’s roster. 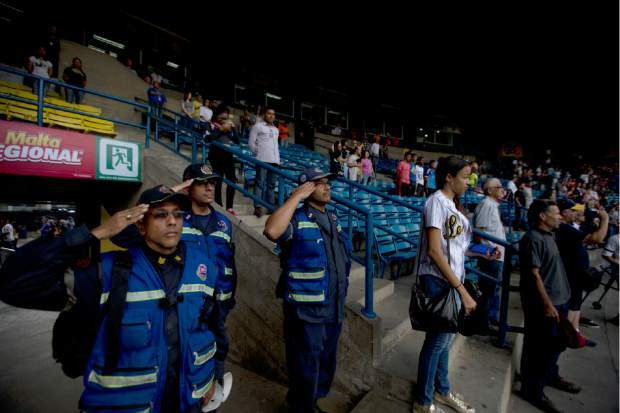 In Maracaibo, Venezuela’s second-largest city, the situation is so dire that the Aguilas (Eagles) team canceled its opener and five other home games this month after an inspector hired by Major League Baseball ruled their diamond didn’t meet minimal safety standards. The club said several of its light towers had the copper wiring stolen and the state government, which owns the facility, hasn’t come up with the relatively modest sum of $39,000 needed to repair the lighting. Still, the Eagles will be playing on the road. Venezuela’s once highly competitive winter league has been in decline for years. While many of the 70-plus Venezuelan players on big league rosters return home for a few games each season, most arriving this year, such as Los Angeles Angels pitcher Eduardo Paredes or Detroit infielder Harold Castro, they are little known and don’t reflect the nation’s powerhouse talent. Meanwhile, major league organizations have shut down all their academies in the country. Venezuela is scheduled to host the Caribbean Series in February at Barquisimeto, one of the cities hardest hit by power outages that have roiled much of the country. 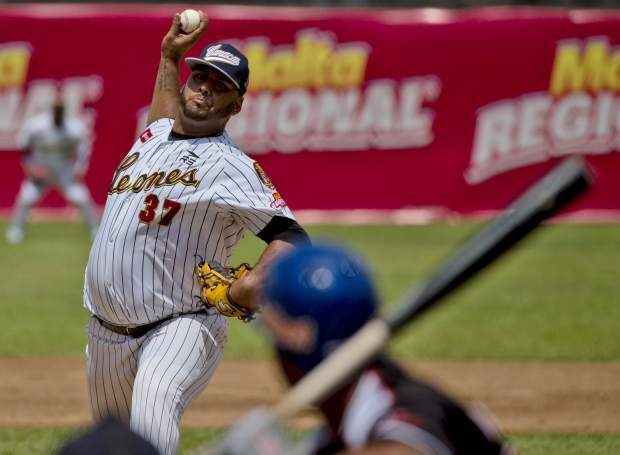 Last year’s tournament, which brings together the champions of five Caribbean winter leagues, was moved from Barquisimeto to Guadalajara, Mexico, following deadly protests against Venezuela’s socialist government. “There wasn’t such a big difference between salaries in the major leagues and what Venezuelan teams could pay,” he said. In something of a departure from his normally fierce criticism of President Nicolas Maduro, Aveledo applauds the government’s decision to spend part of its dwindling supply of dollars on baseball — even if he acknowledges that there are more pressing needs. Indeed, last year stadium attendance rose 5 percent amid the political and economic crisis, although it remains down by a third from a peak in the 2013-14 season. And it’s not just the fans who have to endure sacrifices. 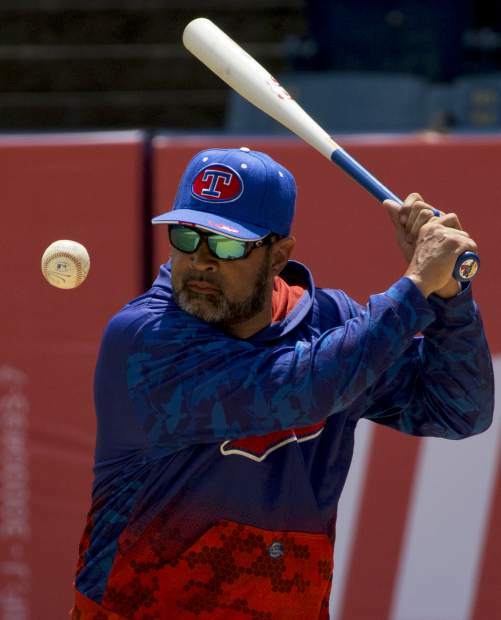 Former All-Star shortstop Ozzie Guillen said he was tempted to skip returning home to manage the La Guaira Tiburones (Sharks) for the third straight season. In addition to cross-country bus rides on dangerous roads, players coming from the U.S. run the risk of getting food poisoning at neglected restaurants. And they have to deal with frequent power blackouts, like the one that postponed Monday’s game between the Bravos (Braves) and Magallanes in Valencia. “But I’m not here to cry,” said Guillen, who for the first time since growing up in poverty near Caracas said he has been without running water at his home in a well-to-do district of the capital.